Providing you the best range of concrete batching plant for fly ash bricks, three bin batching plant only for fly ash & concrete bricks machine and two bin batching plant only for fly ash & concrete bricks machine with effective & timely delivery. In order to cater ever-changing demands of our patrons, we are offering Concrete Batching Plant. Our offered range is fabricated by our well-experienced professionals using advanced technology and first-rate raw material. It is mounted on sturdy chassis made of heavy steel section for the purpose of casting wheels. These plants are designed and engineered for mixing various mortars. We are the leading manufacturer and supplier of Concrete Batching Plant in Tamilnadu, Kerala, Coimbatore, Tirupur, Karur, Salem, Chennai etc. Backed by state-of-the-art infrastructure facilities, we are offering our customers a wide range of Three Bin Batching Plant. These products are manufactured using optimum quality raw material and latest technology. These plants are also offered with single, double and three bins. Durable, reliable and corrosion resistant, these machines are capable of working longer working life. We are the leading manufacturer and supplier of Three Bin Batching Plant in Tamilnadu, Kerala, Coimbatore, Tirupur, Karur, Salem, Chennai etc. Our company is acknowledged for the manufacturer of a range of Two Bin Batching Plant. We offer technological advanced and precision engineered concrete batching & mixing plant. 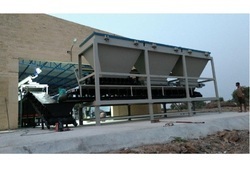 This batching plant provides the right solution to produce superior quality concrete on site. Our range is also available in different specifications that meet the individual requirement of our clients. We are the leading manufacturer and supplier of Two Bin Batching Plant in Tamilnadu, Kerala, Coimbatore, Tirupur, Karur, Salem, Chennai etc.